Leonid Hrabovsky (born in 1935 in Kyiv, Ukraine). One of the most significant and original creative voices to emerge from Eastern Europe in the latter half of the 20th century. From 1954-59, Hrabovsky studied at the Kyiv Conservatory as a composition student of Lev Revutsky and Borys Lyatoshynsky. 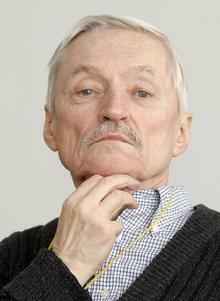 After completing graduate studies in 1962, he earned a PhD in composition and, in the same year, won first prize in an All-Union competition for his Four Ukrainian Songs (1959) for chorus and orchestra, a song cycle which elicited high praise from Shostakovich himself, who remarked: "(The Ukrainian Songs) pleased me immensely ... His arrangements attracted me by the freedom of the treatment and good choral writing". By then, he had already earned a reputation for spearheading the emergence of the Ukrainian musical avant-garde, having translated into both Ukrainian and Russian two important books dealing with serial aesthetics: E. Krenek's Twelve-Tone Counterpoint and H. Jelinek's Introduction to Twelve-Tone Composition. This new direction for Hrabovsky resulted in five works, written in 1964, which virtually set the Soviet musical establishment on its ear: Trio for violin, contrabass and piano, Microstrutturi for oboe solo, From Japanese Haiku for tenor, piccolo, bassoon and xylophone, Pastels for female voice, violin, viola, cello and contrabass, and Konstanten for solo violin, four pianos and six groups of percussion. In the late 1960's, Hrabovsky taught at his alma mater and wrote a good deal of film music for a Kyiv film studio. In 1981, he moved to Moscow, Russia where he taught, wrote both concert and theatre music, and contributed articles to a variety of music periodicals. By then, his music was being performed in virtually every major European city. In 1990, the composer moved to New York to assume the position of Composer-in-residence at the Ukrainian Institute of America. He has received several commissions from New York's acclaimed Continuum ensemble, guest lectured at The Juilliard School, University of Illinois/Urbana-Champaign, Stetson University, University of Nevada/Las Vegas, Sarah Lawrence College, Bard College and abroad. On February 29, 1992, a retrospective concert of his works was given by Continuum at New York's Alice Tully Hall. He is presently living in New Jersey and is active as a composer, organist and guest lecturer. For Elissa for piano solo (see Music Without Borders under "Collections").